The exact address is communicated only when the reservation is confirmed. Glacier Springs Cabin #54 - Breathtaking Mountain Vistas Await You! Glacier Springs Cabin #54 - Breathtaking Mountain Vistas Await You! Breathtaking mountain vistas await you! If amazing views are what you're seeking, it's hard to beat this 2-story, 3-bedroom, 1 3/4-bath family cabin! The first floor features a large mudroom for stowing your gear, along with a full size washer/dryer, a master bedroom with one queen size bed and a walk-out balcony, a second bedroom with one set of bunk beds..Perfect for the kids, a third bedroom with one queen size bed, and one full bath. Ascending the stairwell to the second floor brings you into a large open living space with a fully equipped kitchen, complete with top-of-the-line appliances, granite countertops, and a breakfast bar, plus ample living room seating, a dedicated dining area, and a 3/4 bath. Expansive windows, combined with a southwesterly exposure, provide a territorial and majestic mountain view like no other..Especially when viewed from the balcony. This wifi equipped family vacation property will sleep up to 6-persons (ENFORCED Maximum Occupancy). WI-FI / NO SMOKING / NO PETS / NO HOT TUB / NO CELL SERVICE. Snowline Cabin #45 - This One Has It All! Snowline Cabin #45 - This One Has It All! Perfect for family entertaining, this 2-story, 3+ bedroom, 2 ½-bath family vacation cabin is packed with amenities. The first floor features an open living space with a fully equipped kitchen including granite countertops, a dedicated dining area, a cozy living area with a freestanding gas fireplace, and sliding doors that access the front deck…PLUS a mudroom and separate laundry room with a full size washer/dryer, a half bath, and a large family room with a hide-a-bed, a built-in gas fireplace, a pool table, a foosball table, a DVD/monitor with a movie collection, and a sliding door that leads out to the front deck with a private hot tub and a gas grill…just outside! Ascend the staircase to the second floor and you’ll discover a ¾-bath, a private loft sleeping area with two twin size beds, one bedroom with one full size bed, a second bedroom with two twin size beds, a master bedroom with one queen size bed, plus a walk-in closet, and an en-suite bathroom complete with a jetted bathtub and a separate shower. The master bedroom also provides access to a large balcony overlooking the Snowline community recreational amenities. Don’t forget Fido. This pet-friendly vacation property will sleep 8 to 10-persons (ENFORCED Maximum Occupancy). HOT TUB/PET FRIENDLY/NO SMOKING/NO WIFI/NO CELL SERVICE. Mt. 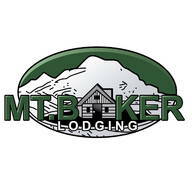 Baker Lodging - Condo #14 - Fireplace, Dishwasher,washer/dryer, Sleeps-6! Snowater Condo #14 - 2 Story Townhouse Condo - Sleeps 6 - Close to Snowater Community Amenities! This standard 2-story, 2-bedroom townhouse style condo is a great family home away from home! The 1st floor features one bedroom with 2-twin beds, 1-bath, a fully equipped kitchen, and an open living/dining area with a gas fireplace and a hide-a-bed, plus a small balcony overlooking the common area. The 2nd floor features a loft master bedroom with 1-king bed, 1-bath, and a laundry cubby with a stack washer/dryer. This newly furnished vacation property will sleep 4 to 6-persons. (ENFORCED Maximum Occupancy! ). Snowater is positioned on 20 acres of magnificent forest on the banks of the Nooksack River which runs on 3 sides of the property. At an elevation of 1000 feet, Snowater is accessible year round. Amenities include two full recreational buildings with two heated swimming pools, hot tubs, a sauna, four tennis courts, basketball, squash/racquetball courts and an adult fitness center. There is a lounge area with free wifi, a pool table, ping pong table and a separate toddler play room. The grounds have bbq/picnic areas as well as a children’s play structure and trails along the river. Snowater is located at the edge of the Snoqualmie National Forest, close to the Mt. Baker Ski Area and spectacular old growth forests, an area rich in history and outdoor opportunities. NO PETS / NON SMOKING/ NO WI-FI. Mt. Baker Rim Cabin #24 - Quiet Country Cabin A quiet country cabin. This 2-story, 1+ bedroom, 1-bath cabin is the perfect country escape. The first floor features an open living, dining, kitchen area with new slate floors, an apartment sized range / oven, a full size refrigerator / freezer, one bedroom with 1-full size bed, one full bathroom, a laundry cubby with a stack washer / dryer, and a free standing gas fireplace in the living room to cozy up to. Ascending the spiral staircase leads to a large open loft sleeping area with 1-queen sized bed. Just outside is a full length deck with an outdoor gas grill..Perfect for relaxing with your favorite beverage while taking in the spectacular mountain views. This vacation property will sleep up to 4-persons (ENFORCED Maximum Occupancy). YES: Wi-Fi NO: Cell Service / Hot Tub / Pets / Smoking Need additional space for a larger group? Consider adding family Cabin #63. Located right next door, these cabins will collectively accommodate up to 10-persons. You must fill in your dates to send the request! Minimum stay: 1 day | Maximum stay: 30 day Duration error: please change your dates. Log in to send your rental request. The ad you are trying to contact is no longer active, please contact other ads. The start date of the rental has passed. The end date of the lease is past or before the lease start date. The number of people selected is not consistent with the housing capacity. The message for the landlord of the accommodation is empty, please explain the reasons for your stay. The number of people selected is too high compared to the capacity of the accommodation. The minimum duration in this accommodation is not valid. Please change your dates. The maximum duration in this accommodation is not valid. Please change your dates. Attention, you can not make a rental request on one of your ads. You have already contacted this landlord recently. Please try again after 48 hours to give them time to answer. The accommodation is not available for these dates, your request was therefore not sent. Please change your dates or check out other ads in the meantime. Thank you for reporting this ad!